This review originally ran in June of 2010. I found myself thinking Holly Hobbie and Fanny again and decided to run this once more. If you are a woman over 40, you probably remember the original Holly Hobbie, seen at left. This bonnet wearing, calico loving waif was an iconic part of my childhood, mostly in doll form, although, since American Greetings owned her image, she adorned everything from wall paper to fabric to greeting cards. 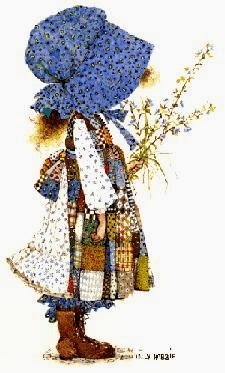 As an adult I was stunned to learn that Holly Hobbie is a real person, an artist and illustrator and not just an appropriately, adorably named prairie girl. 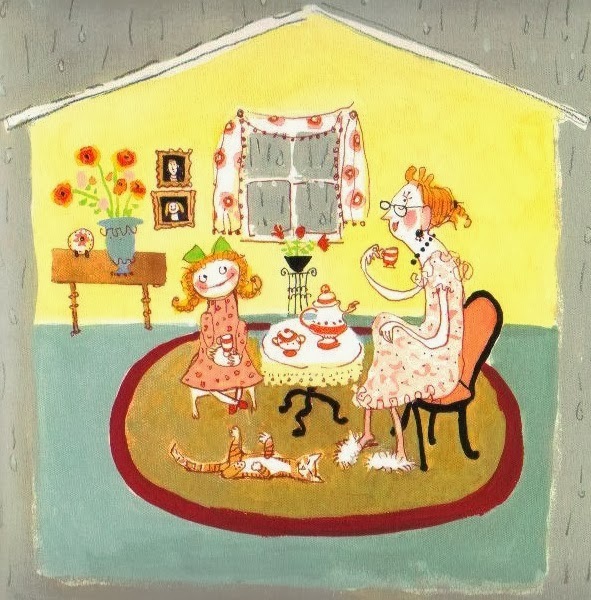 And, her work today is every bit as charming as the character she created so many decades ago. In 1997, Hobbie published the first of many books featuring Toot and Puddle, best friends, opposites and housemates. Toot likes to travel the world, climbing mountains and eating exotic foods while Puddle prefers to stay at home, roaming the forests around Woodcock Pocket, baking, making snowmen and splashing in mud puddles in the Spring. Fanny begins like this, "For her birthday this year, Fanny had her heart set on a Connie doll. She has asked for a Connie for her last birthday and then again for Christmas, too. It was the only kind of doll she wanted." When her mother makes it clear that she will not be buying Fanny a Connie doll ("Because I don't like the way Connie dolls look. They're just too . . . much," her mother - and Hobbie - tactfully responds) Fanny decides to make her own Connie doll. Using her old pink pajama top and yarn, Fanny makes her Connie. But, when she looks at the doll's face, she decides that Connie isn't exactly the best name and she decides to name her Annabelle. Of course, Fanny's Connie owning friends don't think much of Annabelle or the sewing machine that Fanny gets for her birthday and Fanny begins to have second thoughts about her doll, even going so far as to stick her in a drawer instead of taking her to be like usual. But, things work themselves out. Annabelle is taken out of the drawer and get to play veterinarian while her friends' Connie dolls serve as nurses. 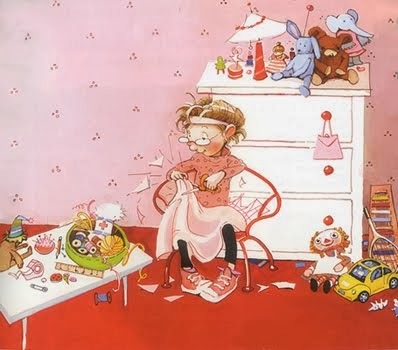 The book ends with Fanny making a doll for Annabelle. Fanny and Annabelle try to think up good names but fail. Then then new little doll pipes up and asks to be named Connie. "Hmm," Fanny says, "I'm sure there's never been a Connie like you." 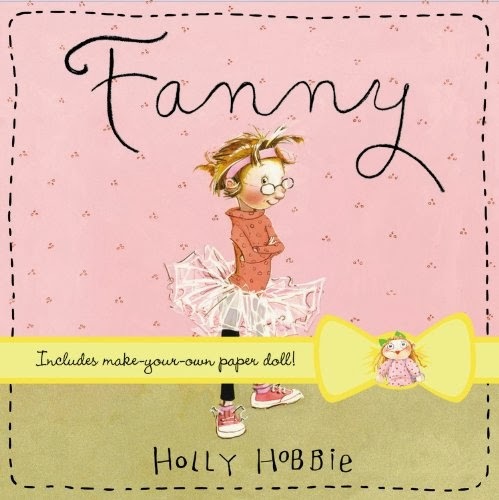 The book Fanny comes with an Annabelle paper doll to punch out, as well as a blank paper doll for readers to decorate. Fanny & Annabelle finds the two friends stuck inside on a rainy day. 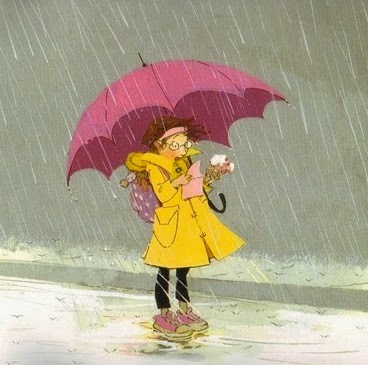 Fanny decides to write a book called, Annabelle's Adventure. The story, which is about Annabelle's search for the perfect present for her Aunt Sally, takes shape over the course of the book as Fanny takes the occasional break when writer's block interferes. Fanny's book is part of the larger book, Annabelle's story alternating with Fanny's, but following similar paths. The stories take an interesting turn when Fanny finds a pink envelope containing two $50.00 bills and her story diverges from Annabelle's. However, both books end on a satisfying note and Hobbie proves, once again, that she is as masterful a story teller as she is an illustrator. 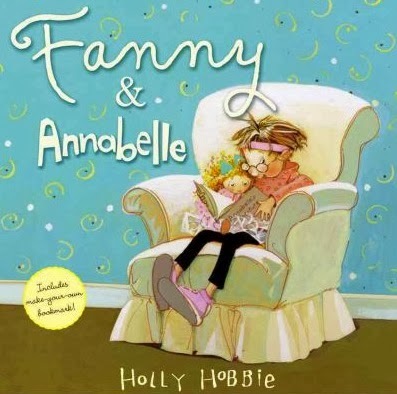 My only fear, based on my limited experience with the public as a bookseller, is that so few girls play with dolls at the advanced age of 6 or 7 anymore, the age when they are really old enough to truly appreciate Fanny and Fanny & Annabelle. And I'm sure even fewer make their own dolls anymore. Hopefully Fanny and Fanny & Annabelle will have a long shelf life and inspire many a girl (and her mother?) to pick up the needle and thread and make a doll or two! I just took my almost six year-old twins to a children's art festival where they learned to make dolls. Maybe our culture in the past couple decades has been too busy and spoiled to value homemade things. I am hopeful that our economic downswing will be a blessing for the return of teaching home arts to kids. 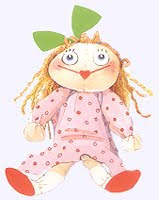 I love Holly Hobbie's books, and most especially "Fanny"! Thank you for highlighting these excellent books. What a wonderful festival - and wonderful skill to learn! 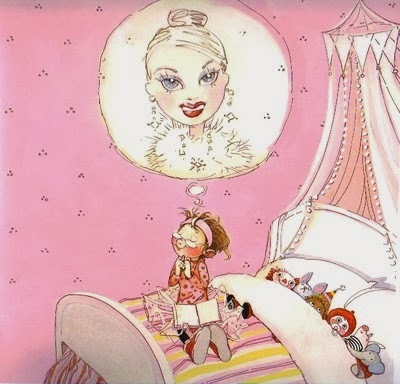 "Fanny" is a marvelous book and I am so glad that there are beautiful picture books that reflect the interest of your children and hopefully others. Thanks for your comment.